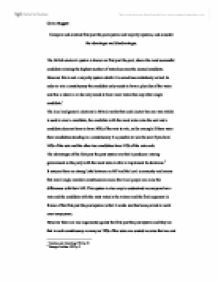 Compare and contrast first past the post system and majority systems, and consider the advantages and disadvantages. 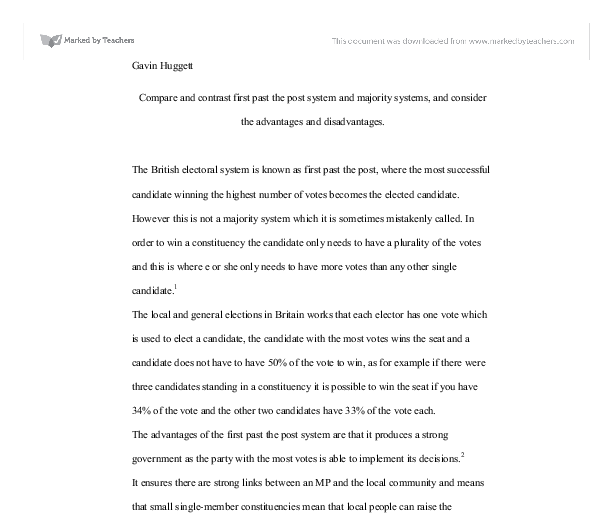 Compare and contrast first past the post system and majority systems, and consider the advantages and disadvantages. The British electoral system is known as first past the post, where the most successful candidate winning the highest number of votes becomes the elected candidate. However this is not a majority system which it is sometimes mistakenly called. In order to win a constituency the candidate only needs to have a plurality of the votes and this is where e or she only needs to have more votes than any other single candidate.1 The local and general elections in Britain works that each elector has one vote which is used to elect a candidate, the candidate with the most votes wins the seat and a candidate does not have to have 50% of the vote to win, as for example if there were three candidates standing in a constituency it is possible to win the seat if you have 34% of the vote and the other two candidates have 33% of the vote each. ...read more. As a result of this the number of seats won is not proportional to the number of votes in that parties favour and under this system a party can win fewer votes than another party but more seats. Another drawback of the system is that the winning party rarely wins an outright majority (more than 50% of the votes) meaning a majority of the voters voted against the winning party rather than in favour of them. The third drawback of the system is regional imbalance where conservatives at a disadvantage as there votes a geographically evenly spread from one part of the country to the other whereas labour and liberal democrats are more unevenly spread giving them areas of majority voters disadvantaging the conservative party when it comes to translating votes into seats. Another drawback is the over importance of marginals this is where the seats can go to any of the parties and determine the fate of the country. ...read more. Under the alternative vote system voters have the opportunity to rank the candidates names on the ballot paper in order of preference. If any candidate receives more than 50% of the vote in the initial ballot that candidate is elected however if no candidate receives more than 50% of the vote then the candidate with the lowest number of first preferences is eliminated and the second preferences are redistributed and this continues to happen until one candidate wins a majority of the vote. The advantages of this system are that the winning candidate must have a majority vote to win the vote however the disadvantages are that the system leads to disproportional support for the centre parties as they are not usually voters first choice and usually there second choice putting them at a disadvantage if the candidate is elected in on the initial ballot. The second majority system is known as the supplementary vote system it differs slightly from the alternative vote system as the voters only have two preference votes. Those who gain 50% in the initial ballot are elected in just as they are in the alternative vote system. ...read more. Also, these photocopied back-ups are contained within the same office, which strikes me as a silly decision. If a fire were to ravage the offices, the back-ups would be burned along with the originals. The manger would like me to be able to archive records in the new system, so I'll need a strategy for backing up the data. This is exactly what happened in the 1951 General election, The Conservatives won the election with 48.0% of the vote yet Labour had 48.8% of the vote and lost. This does not seem fair but because the First Past the Post system works as it does these results are possible. Glossary Acid Rain: Also called acid precipitation or acid deposition; precipitation containing nitric and sulfuric acids formed by NO, and SO, released into the atmosphere when fossil fuels are burned. Demonstrated Reserves: Coal potentially mineable with existing technology, estimated at 475 billion tons in U.S.; current mining methods may not recover all these reserves. If you do not buy items that are compatible with your computer, then they may not work correctly, or at all. Availability If there is limited availability for a piece of hardware then the supply itself may be limited. Limited supply has a knock-on adverse effect on cost. To produce this it takes a long time, thus the proprietor has to count the items in the stock room. > The receipt - the cashier has to write the item name and the price of the item, which is dated and given to the customer.